If you’re thinking about starting a small home business and you’re passionate about jewelry, you should consider a business related to jewelry. You have two options when it comes to this line of business. You can either sell jewelry from a supplier which makes you a distributor or you can create your own collection of jewelries and sell these. Now, if you choose to go with the second option, you may naturally be a bit apprehensive about this because you have no experience with jewelry making. Fret no more. There are lots of jewelry making classes being offered today and not just in regular classrooms at that; online courses are also available. Before you sign-up, you should know that there are paid courses and there are free courses. It might be a good idea to try first the free online courses for jewelry making so you can already learn about the basics. Usually, the free courses are offered by people who have already established their small home business of jewelry making and these are available through their personal blogs. The paid courses on the other hand, are generally offered by actual schools and they may have a land-based school as well – both focused on jewelry making. Depending on what type of jewelry you want to concentrate on, there are courses that can help you create beaded necklaces, bracelets and anklets; or metal jewelries. What Entails Jewelry Making Lessons? For starters, you will need to know what types of materials you are going to use for your jewelries. You also need to know the various tools used in creating these fashion pieces. Online courses for jewelry making usually focus their first lesson on these essential items for creating jewelries. If you want to concentrate on beaded jewelry, the next lesson usually teaches you techniques on beading. 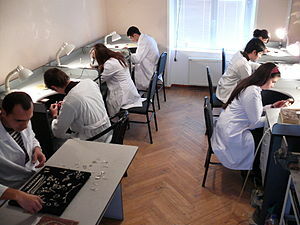 On the other hand, if your concentration is on metal jewelries; the courses will start you with an introduction to the various types of metals used for jewelry making. Metals include gold, silver and platinum. You will also learn about wirings particular how to make jump rings and how to use dowels as well as forming pliers and other tools as determined by the course provider. If you wish to create a jewelry set that includes a necklace, a pair of earrings and a ring; there are also courses that can help you create each one of these jewelries including how to create a chain for your necklace, how to stamp and engrave a pendant, and how to stamp rings. Once you’ve learned the fundamentals of jewelry making, you can tap into your creative juices and make jewelry pieces stamped with your unique designs.